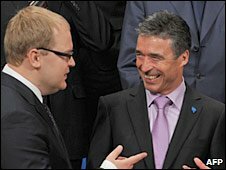 Nato foreign ministers have agreed to launch a Membership Action Plan (MAP) for Bosnia-Hercegovina - a penultimate step to joining the military alliance. "MAP has been granted to Bosnia today, but with clear conditions," alliance spokesman James Appathurai said at a Nato summit in Tallinn, Estonia. He said that all military equipment in Bosnia must be registered as belonging to the central state government. Bosnia, which was ravaged by war in the 1990s, applied for a MAP in 2009. A MAP is a multi-stage process of political dialogue and military reform to bring a candidate country in line with Nato standards. The process can take several years before a full membership in the alliance is granted. The prospect of joining Nato - and also the EU - has been a powerful drive for reform in the former Yugoslavia, which was ravaged by wars in the 1990s. Croatia joined the alliance last April, while Montenegro was granted a MAP last December. Bosnia is now an independent state, but under international administration. The 1995 Dayton peace accord, which ended the 1992-95 Bosnian war, set up two separate entities: a Bosniak-Croat Federation of Bosnia-Hercegovina, and the Bosnian Serb Republic (Republika Srpska), each with its own president, government, parliament, police and other bodies. Overarching these entities is a central Bosnian government and rotating presidency.